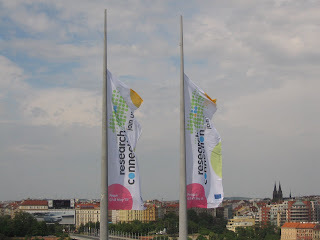 It’s the second and final day of Research Connection here in Prague and both delegates and exhibitors have started to acquire the slightly glassy eyed appearance that comes from hours of intensive networking, lack of sleep and generous conference catering. 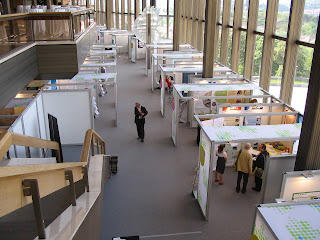 However the exhibition is still going strong, with much exchanging of business cards and efforts to find potential areas for collaboration. A stroll around the exhibition area reveals everything from large-scale projects with the most visionary of blue sky research in mind to highly practically-focused projects with refreshingly everyday applications. The EU-FRESHBAKE project for example, brings freshly baked bread to your local supermarket with superior texture and nutritional values using the Bake Off Technology. Equally fundamental but on much a larger scale is the ITER project, destined for construction at Cadarache in France, which will become the world’s biggest experimental fusion reactor. Fusion offers the promise of an unlimited future energy source that is safe, environmentally responsible and economically viable. Looking at the sheer scale of the project – the tokamak will be 24 metres in diameter - brings back to mind Jeremy Rifkin’s call for a “third industrial revolution” to stave off global warming. Economic revolutions are made possible by technological revolutions, with grid technology a major driving force. Pausing only to sample the delicious Czech nibbles circulating through the crowd thanks to the very attentive local staff, selflessly working during the 8th May local holiday, another project catches my eye. The attractively-named LifeWatch project has a small booth showcasing ‘FlySafe’, an application that helps avoid catastrophic mid-flight ‘bird strikes’ by alerting military and civilian planes to bird migrations across Europe. Bringing together data from military and weather radars, as well as signal traces from individually tagged birds, ‘Flysafe’ merges these originally incompatible sources of data to drive complex simulations of bird movements. The demonstrator tells me that he thinks the system could be gridified in the not too distant future – watch out for more news in future publications! So as this particularly diverse and energizing conference comes to a close, it just remains to pack up the booth, and thank the tireless demonstrators Tsjerk Wassenaar, University of Utrecht and Andrea Giachetti of CERM in Itay, who brought their prize-winning "e-NMR GRID platform for structural biology" demo from the EGEE 4th User Forum to Prague. Not to mention my assistant from local EGEE partner CESNET, Vlasta Zakova, who demonstrated her impressive juggling skills to help draw in visitors to the booth. From Prague, na shledanou!